Carlos | HASHIMOTO INDUSTRY Co.,Ltd. [L Factory] Manufacture and sale of leather products / Manufacture and sales of various leather tapes. The raw skin uses the highest grade steer from North America. Glove tanning aimed at preserving the fibre and finish without excessive elongation of the leather, avoiding wrinkles and enjoying the inherent flexibility and moist feel of the leather. It is lighter than conventional glove leather, and also features rich colour developments. Hashimoto Industry, in pursuit of the possibilities of leather, sells an “original sample book” of each product so that you may actually feel and see the quality and colour variation of our products. If you wish to purchase “Carlos“, please proceed to the “Sample Book List” from the button below and select “Carlos” to let us know the content of your order. 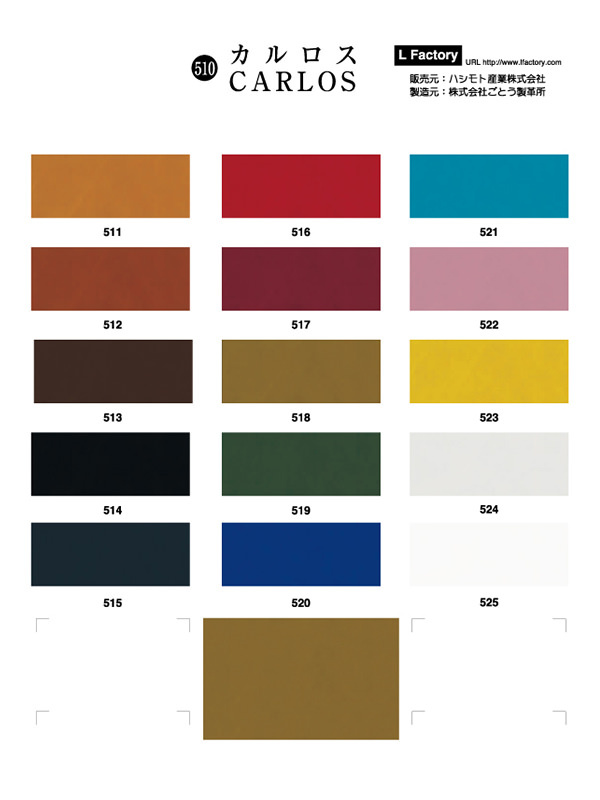 · Each sample book has a different number of samples based on the colour variation of the product. · The selling price will be a uniform 1100 yen each (including tax) with free shipping. · The payment method will be Cash On Delivery. · Cash On Delivery fees will be paid by the customer. ※Please be aware that there can be delays for inquiries received on Saturdays, Sundays, public holidays, during New Year’s holidays and large consecutive holidays. We will contact you as soon as possible after the holiday. Chrome Leather : Inquiries about "Carlos"
Click Here for inquiries about purchases · products.